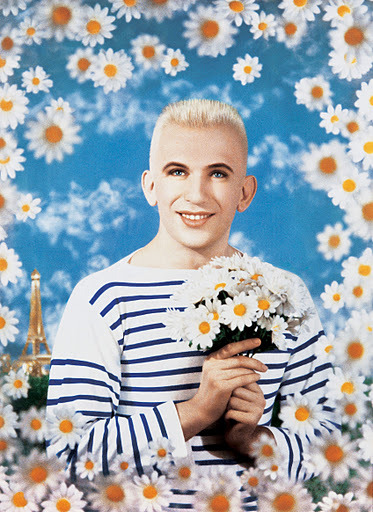 Jean Paul Gaultier cover photo for his autobiography published in 1990. Designers are to be in connection with what’s happening with the movement of society. 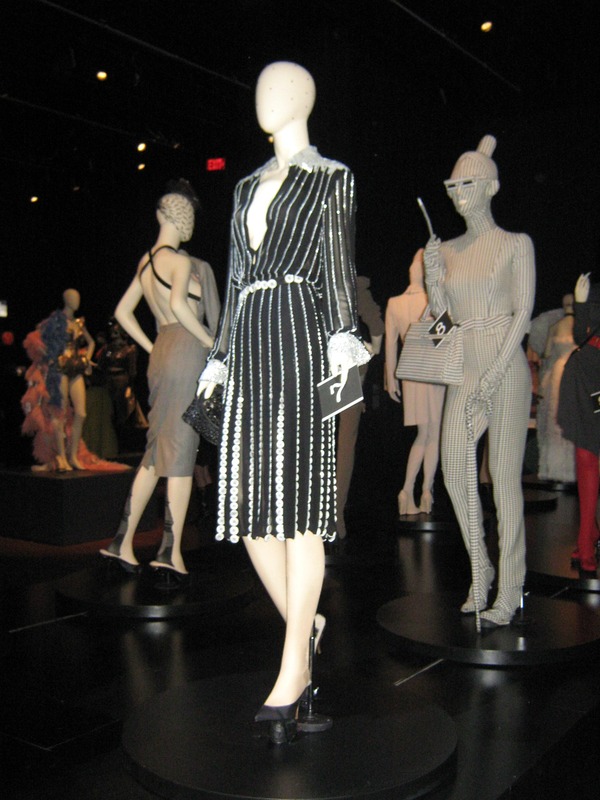 Over Dressed for Life readers in the SF Bay Area will not want to miss the current exhibition at the de Young Museum – The Fashion World of Jean Paul Gaultier: From the Sidewalk to the Catwalk. I got a sneak peek last week and … it is fantastique. Watch for my full coverage later this week. 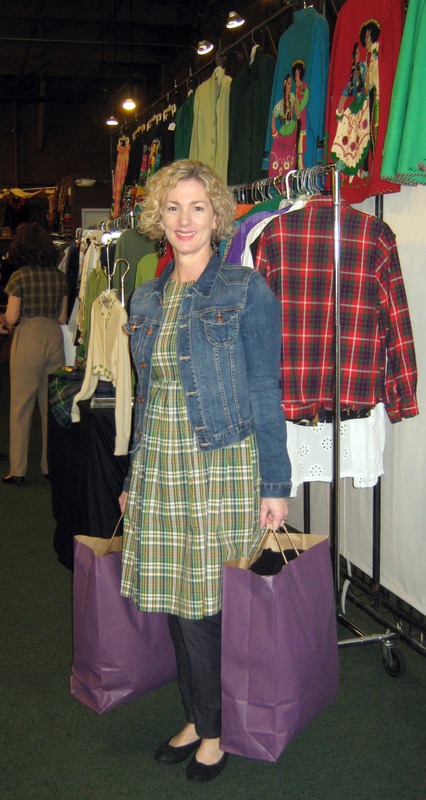 Designer and Fashion Star contestant Lisa Hunter shopping at the Vintage Fashion Expo in San Francisco. The Vintage Fashion Expo last weekend was, as always, great fun and a shopping success. I found a Joseph Magnin 1970s patent leather handbag and a fantastic pair of navy and white leather gloves with ah … slits in the wrists. Really! I’ve never seen anything like them. But my real find was Lisa Hunter, contestant on the new fashion reality show Fashion Star. I spotted Lisa conversing with another attendee and introduced myself. Friendly and ready to talk vintage fashions, Lisa agreed to take a break from her shopping and chat. Lisa told me she got into vintage when she was studying fashion design at Fashion Institute of Design and Merchandising. One day she picked up a copy of the school’s newsletter and saw a help wanted ad for someone to work the Vintage Fashion Expo. She got the job and when she showed up on that first day, she was blown away by all the beautiful vintage clothing. “I felt like I died and went to heaven,” explained Lisa sporting a retro curly bob hairstyle and a green plaid dress from her own line. Although she had grown up watching old movies with her mother and loved glamour, vintage fashions were not on her radar. At FIDM she was thinking of designing clothes for tweens. But after working the Expo for three years surrounded by the best in vintage clothing, her whole fashion focus shifted. After she graduated from FIDM in 2004 Lisa started her own line – Vian Hunter. She now lives in Seattle, Washington and has a store where she features her own vintage-inspired designs as well as a selection of vintage clothing. The late 50s to early 60s is her favorite period. At the Expo that day Lisa shopped for coats, suits, and fitted jackets for fall as well as dressy dresses. Seattle is celebrating the 50th anniversary of the opening of the Space Needle and many of Lisa’s customers are attending the big 1960s themed party. I asked Lisa what’s inspiring her these days. “The new longer skirt lengths I find oddly refreshing,” she says, “and eight inch hems.” Back in the day, skirts and dresses had big hems and Lisa is pondering that as a design element. Hmmm … I like that idea. For those of you watching Fashion Star you know that Lisa is a contestant and she was a winner on this week’s episode with Macy’s picking up her sleeveless pleated empire waist dress. Congratulations Lisa and a big thank you for taking time to speak with Over Dressed for Life. 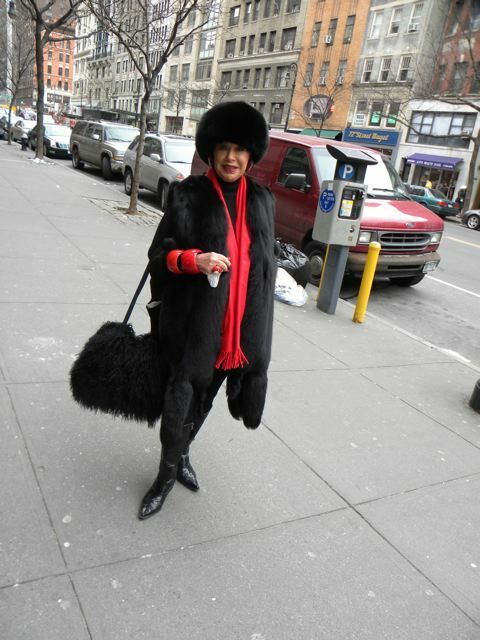 Lynn Dell looking stylish in faux fur. Photo by Seth Cohen. Fashion says me too and style says only me. This is right on. Lynn Dell is known as The Countess of Glamour and she is often featured in Ari Seth Cohen’s blog Advanced Style. The owner of Off Broadway Boutique in NYC, Lynn is also part of the upcoming documentary film about stylish older women. Congratulations Ari … I cannot wait to read it! 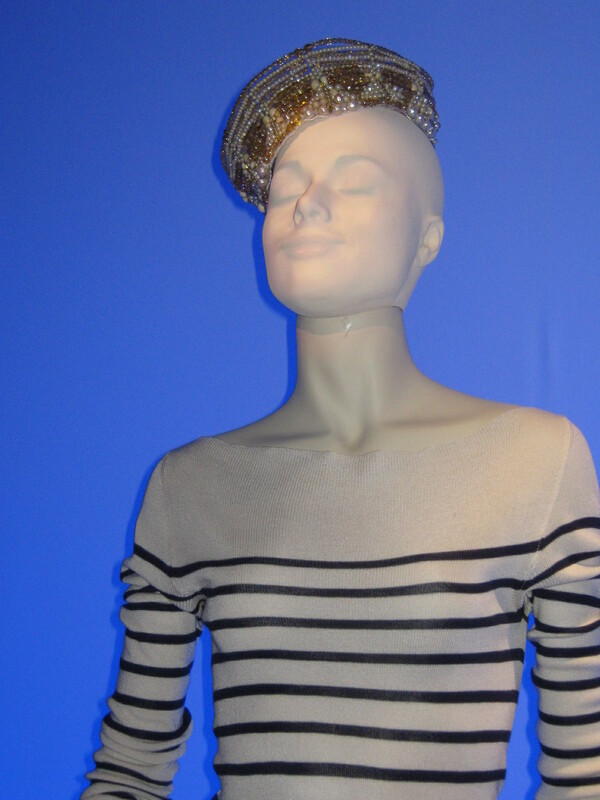 One way or another, vintage fashions are always in. 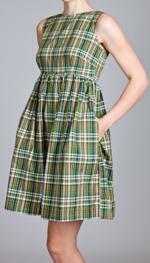 This season the big fashion story is the Ladylike Dress of the 1950s – nipped-waist, full skirt. 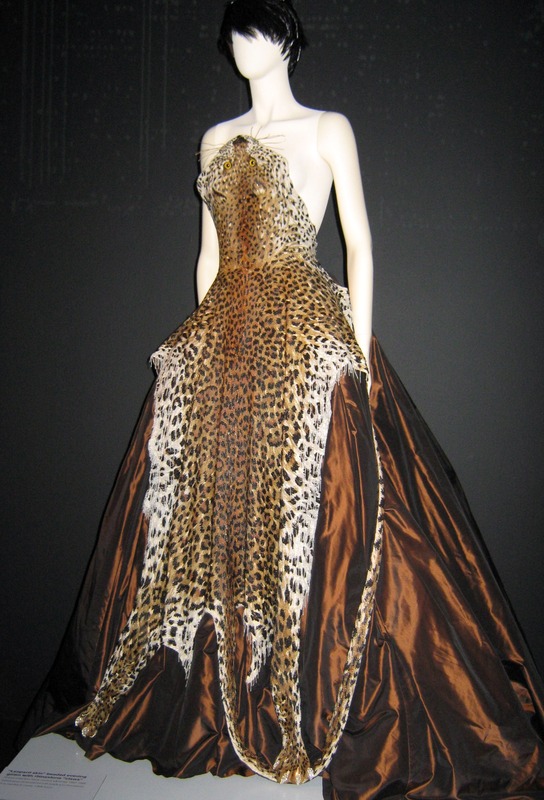 The best place to pick up an original of the new trend is of course The Vintage Fashion Expo this weekend March 17th and 18th at the Concourse Exhibition Center in San Francisco. Vintage-inspired dress by Lisa Hunter from Vian Hunter House of Fashion. I never miss the Expo and guess who else will be there – Lisa Hunter, current contestant on the newest NBC television fashion show Fashion Star. Lisa is a women’s clothing designer and longtime shopper at the Expo. Lisa isn’t the only fashionable to shop the Expo. Stylists, fashion students, fashion journalists (like moi), collectors, and clothing historians are just some of the folks in the biz who find the Expo not just a place to buy vintage, but also to find inspiration, meet like-minded people, and network. For over 30 years, every spring and fall The Vintage Fashion Expo has brought to us 80 dealers from around the country offering fashions and accessories for men, women, and children from the 1850s to the 1980s. There’s something for everyone and more. 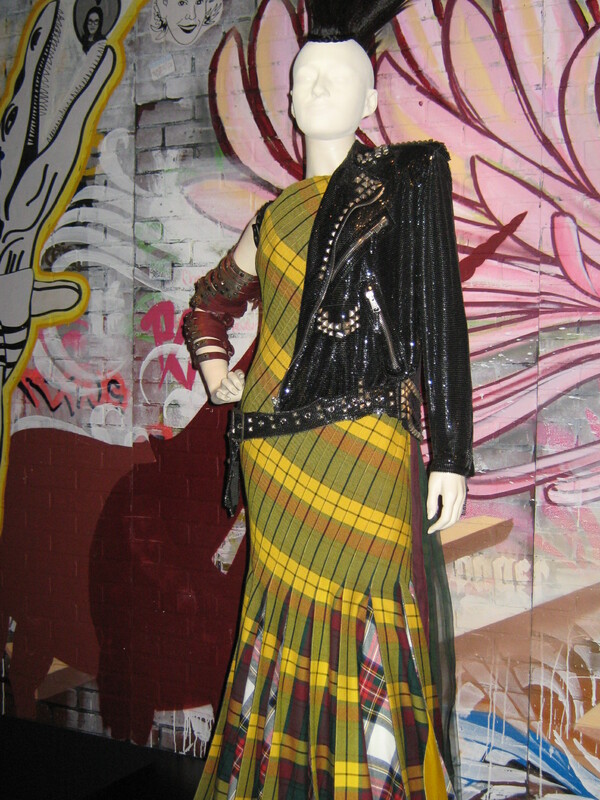 The Vintage Fashion Expo, March 17th and 18th, 2012 at the Concourse Exhibition Center, 635 8th Street at Brannan, SF. Saturday hours, Early Bird $20 admission 9am to 10:30 AM. Regular hours $10 admission 10:30 to 6pm. Sunday, 11am to 5pm. Students with ID free on Sunday. Stephen Jones berets. Photo used by permission from Linda McLean. The beret is the t-shirt of hats. Quite true. A black beret is my go-to hat. Berets always look sharp and can pop up an otherwise bland outfit. Plus they’re warm and easy to slip into a suitcase or handbag. 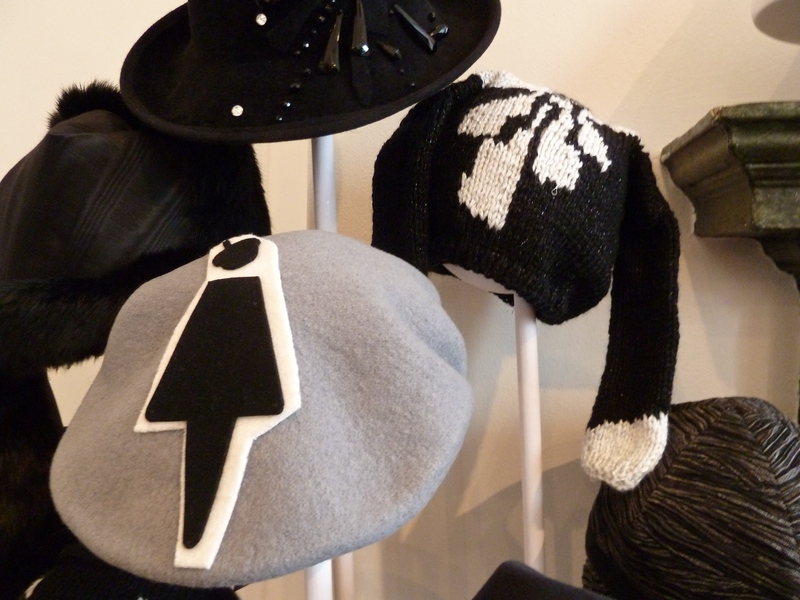 Berets are even better when adorned with a little something. I had a dream once in which I was searching for a tassel to sew on my black beret. In my waking life I thought that was a darn good idea, so I found a tassel and promptly started sewing. On another beret from my collection, I sewed black cut-glass Victorian buttons. One can get very creative when embellishing a beret. Stephen Jones says berets look good on everyone. He should know, he’s one of Britain’s top milliners. 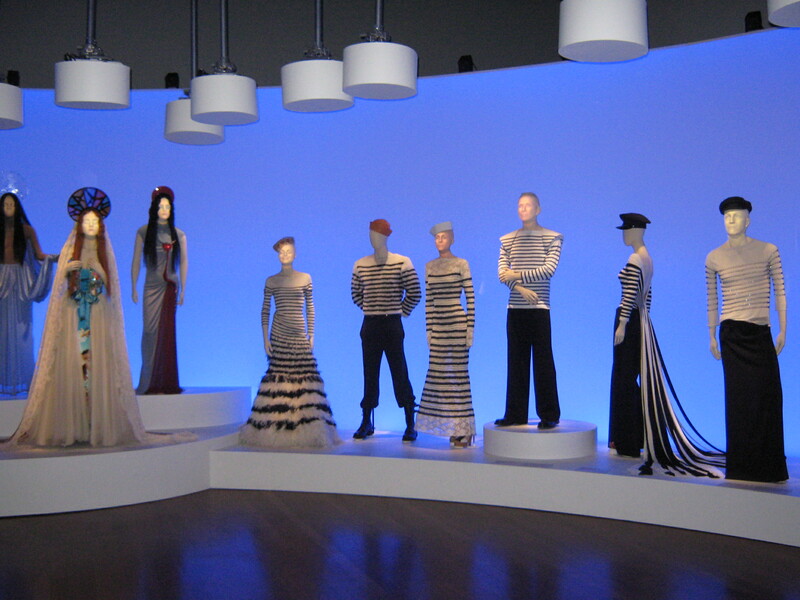 In 2009 he co-curated the exhibition, Hats: An Anthology for the Victoria & Albert Museum in London. Last week Catherine Duchess of Cambridge attended a royal event looking modern yet ladylike showing women how it’s done. As part of Queen Elizabeth’s Diamond Jubilee celebrations, Catherine, Camilla, and The Queen visited the upscale shop Fortnum & Mason in Piccadilly. Catherine is sporting a smart blue coat-dress by Missoni. Note that her hem hits right above the knee showing off just enough leg, but not revealing too much if she sits down. Her shoes are simple suede pumps, not a flashy pair of platform stilettos. She’s also wearing stockings, which is royal protocol. Now, I am not a fan of wearing stockings because they are so darn uncomfortable but they do complete an outfit nicely. Bare legs, especially in a suit or a short tailored dress, look too casual. Catherine is well put-together as always and a great role model for us. It seems women these days mistakenly think that what they wear clubbing is what’s appropriate for dressy or professional occasions – business lunches, meetings, baptisms, weddings, you name it. Somewhere along the path of fashion women, even supposed fashionable women, have become confused about what is appropriate attire. I suppose when fashion rules faded away, so did our fashion common sense. In general it seems an either/or situation – some variation on jeans, t-shirts, and flip-flops or tight-fitting clubbing gear. What happened to dress suits and gowns for evening events? Demure dresses for day? Checking out this season’s fashion trends, I do think that Catherine is having a positive effect. The Ladylike Look is in with dresses a big player as well as longer skirts, and feminine blouses (that don’t show too much cleavage). 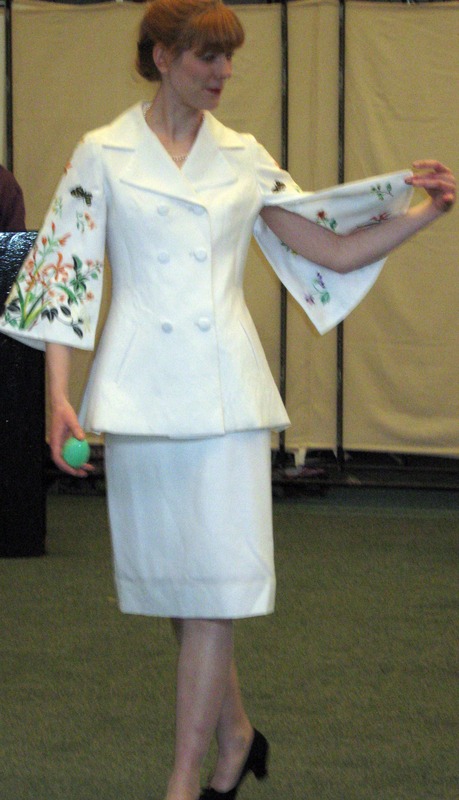 OK, I am now stepping off my fashionable soap box, carefully and elegantly, like a lady of course.